Good to see you again. I was wondering where you have been. Looks like this is what you have been working on!!! I can't wait to see it's hammer in Vladimir's Book Wars! VocalTechnique wrote: I can't wait to see it's hammer in Vladimir's Book Wars! Its style of play is not important now. the important question is: is the book a derivative or an original book? Indeed, Black Pearl Chess PRO v.1.0 plays a different style . A lot of heavy tuning has been placed upon this opening book. With regards to the title of the Book, I myself do not think it is a derivative of any books current that I know of. That sounds good. Is it a private book or public? Did you get a chance to test this book? It is big and have different moves but I didn't find it that strong. In fact, I found the winner of Bookswar 5 stronger than this book. May be I am not right as I am new in this field (Incorrect parameters etc) ? No disrespect for the book and the owner of this book. It is heavily tuned though. Just curious to know the result. We have a new leader so far then.. Congrats Mohammed Nayeem Would love to see this book in the next bookswar6. 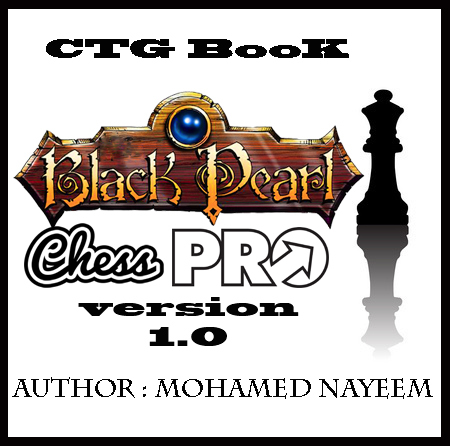 s.chess wrote: We have a new leader so far then.. Congrats Mohammed Nayeem Would love to see this book in the next bookswar6. what is the book setting optimize 0/100? @seeking_assistance wrote: what is the book setting optimize 0/100?